Automobile accidents are a common occurrence on roads all across the country. One common form of accidents is a T-bone collision. A T-bone collision, also known as a broadside collision, describes an accident in which the front end of one car crashes into the side of another vehicle. T-bone accidents put the driver and passenger of a vehicle at great risk for injury. These collisions are also dangerous because they push the car off its intended course and may lead to further collisions. When our White Plains clients have been involved in T-bone accidents, our personal injury attorneys at Worby Groner Edelman, LLP explore the cause of the collision to ensure that our client’s rights are fully protected. Failure to yield the right of way: Most T-bone collisions occur in intersections and they often happen because one vehicle has failed to yield the right of way. Failure to adhere to proper rules of the road is likely to have dangerous consequences. Failure to stop at a red light: Running a red light brings a driver into oncoming traffic and is likely to result in a T-bone accident. Improper left turn: Making a left turn without following the proper rules of the road or adhering to lights and signals can result in a T-bone collision. Distracted driving: There are many distractions that can cause a driver to lose focus, including talking on cell phones and texting. Becoming distracted while driving increases the chances of a collision. Reckless driving: Reckless driving includes unsafe driving habits such as speeding, erratic lane changes, and driving with too many passengers in the car. 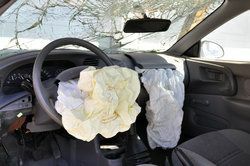 This creates a dangerous situation that can lead to an accident. Driving under the influence: Drivers who are under the influence of alcohol or drugs are impaired in their decision-making abilities. This condition is a common cause of vehicle accidents. Road Design: Roads that are poorly marked or those that have a hazardous design can be difficult to navigate and increase the chances of collision. Vehicle failure: In some instances, a T-bone collision may be caused by a vehicle malfunction, including brake failure or loss of steering. When a T-bone collision does occur, our auto accident attorneys can explore the cause of the accident and advise clients on their best plan of action in order to ensure that their rights are protected and that any due compensation is received. If you have been involved in a T-bone accident, our attorneys can protect your rights and ensure you get the compensation you deserve for personal injuries and/or property damage. Our lawyers have the skill and determination to get you maximum results. Contact us at your earliest convenience to discuss your rights.